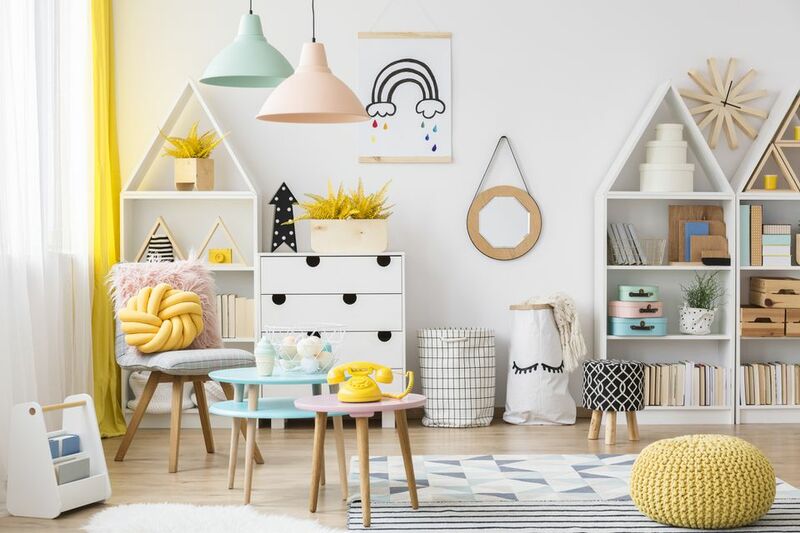 Decorating a kid's room can be really fun! Don't be afraid to play with whimsical themes, bright colors and bold styles. These DIY projects are great decor ideas for decorating a kid's room. Make your child's space feel special and personalized for them with one or many of these projects! Instead of a typical rug, give your child an adorable plush animal mat for them to play on. With a bit of sewing, you can make a lion rug out of furry tan fabric and some upholstery fringe in just one afternoon. Kids love cute balloon animals, so make them one that will never pop with this great DIY. Instead of a typical bed frame, construct one to look like a house instead. This clever DIY bed is perfect, as it can be used as a playhouse during the day. It's also a clever twist on the traditional canopy bed and will look great in any child's room. Use plastic toy animals to make some wall hooks for some extra storage. Once your children have outgrown their cribs, give them their own homemade gorgeous bed to sleep on. Using reclaimed wood, you can make a bed frame inspired by West Elm. The amazing DIY project provides building instructions for a twin, full, queen or king, so you can build the exact bed size you need. These wooden toy bins are much more stylish then the plastic trunks you find at the toy store. Give a fun makeover to a thrifted toddler table for this DIY. Making a giant chalkboard is super easy, and kids will love drawing on it. Help your child to develop a love of reading by building them their very own library area. This small book bin is the perfect height for your child to grab a book to read, and–best of all–it's easy to build! Add some playful wall decor with this sweet felt cloud. Give the illusion of a large potted plant with this cactus stool. Go bold in your kid's room with a hand-painted wallpaper design of cats, cameras, pizza, and candy. Add some creative toy storage crates to your child's room for the perfect spot to store toys and stuffed animals. No sewing skills required to make these sweet star pillows. This platform bed is the perfect size for your growing child. Add some sparkle to your son or daughter's bedroom with these DIY heart bookends. Convert a small bookcase into a dollhouse with this creative project. For some easy decor, hang a DIY felt banner in your kid's room. This DIY that says "my heart" in French will take under 30 minutes to make. This 'stay little forever' DIY is the perfect way to add some art to a young child's bedroom. Add a burst of color to your son or daughter's room with a lovely rainbow wall hanging. This DIY teddy bear rug is perfect for your child's room, as it will give them a soft spot to sit on while they play with their toys. Add some color to your child's bedroom by painting a diagonal accent wall. Give an amazing makeover to Ikea's play kitchen by adding a wood countertop and a tile backsplash. Give a fresh look to Ikea's rocking moose by turning it into a furry rocking sheep instead. The more minimalist rocker is perfect for young kids. Encourage a life-long love of reading by installing a library wall in your child's room. These DIY gold animal bookends provide a fun way to display your child's favorite reads. Update your child's bedding by adding a plush cat face pillow. Create a mini gallery wall to display your child's art with this simple DIY idea. Display your child's toys like art, so they're easy to find. Your child will love this handmade cloud pillow! Cut animal silhouettes out of scrapbook paper for some wild wall art. These DIY reversible storage bins are perfect for storing stuffed animals. Hang this printable artwork in your young child's bedroom for some easy decor. Toss this DIY heart pillow on a chair or on the bed in your child's room to add a metallic accent. Kids will adore this soft rainbow fur blanket that is perfect for nap time. Move your child's toys from the bedroom to the living room, to the playroom and back to the bedroom with this rolling toy box. This weekend, try making this outstanding pretzel pillow for your child's room. Surprise your toddler by adding a small desk to their room. The workspace will allow them plenty of room to work on their art. Personalize your kid's bedroom with a name sign. Keep your child warm at night with a cozy pastel quilt that you made them. Maximize space in a small bedroom by raising the bed and adding a desk underneath. You can build a sturdy loft bed that your son or daughter will love. Instead of buying an expensive new toy, make an ice cream cart toy out of cardboard. This fun DIY is sure to entertain kids for hours. Instead of buying wall decals, save money by making some giant animal wall stickers. Use a hula hoop to make a small tent, which works perfectly as a reading corner in a bedroom. Add a whiteboard to your child's room to give them the perfect spot to draw or practice writing on. Hang this DIY plush cats and clouds mobile over a young infant's bed for some cute nursery decor. Download and print one of these six designs for some free art. Use large sheets of foam board to make a playhouse that you can collapse and store when not in use.